Blue Kay Cabanas are located at the north end of the malecon, right next to the Navy base at the foot of the lighthouse. Blue Kay has 200 meters of some of the most beautiful beach front you will ever see. Blue Kay has cabanas, restaurant, and a lot of other activities for someone visiting Mahahual. Their cabanas are right on the beach, right off the malecon. Blue Kay is owned by Juan Carlos Ortega, one of the pioneers in Mahahual. Juan Carlos is originally from Mexico City, and he went to college in Monterrey. I met with Juan Carlos yesterday at Blue Kay, and he told me his story, and how he ended up in business in Mahahual. Juan Carlos Ortega, happy in Mahahual. Juan Carlos first came to Mahahual in 1985, over 30 years ago. They opened the first entrance to Mahahual by road in 1984, and he was one of the first to come and scout around for business opportunities here. There were no paved roads then, nothing except for a few fishermen catching fish, lobster, and conch. He liked what he saw, and came back in 1988, and bought 400 hectares of land. He has some properties in the town of Mahahual, as well as Blue Kay. He also has some lots that he is going to develop and build houses on in the near future. Juan Carlos told me he likes doing business in Mahahual. 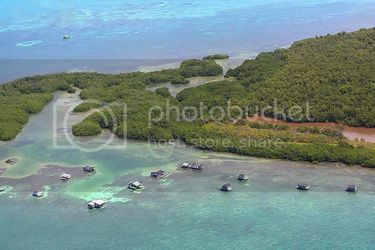 It is a peaceful place, with easy access to everywhere, Chetumal, Cancun, and places like that. There are places and things to see nearby, like Mayan ruins and Banco Chinchorro. You are away from the hassles of the big city, but have all conveniences of modern living here. He also told me he loves the beach and the sunsets here. He also feels it is a good place to do business because of the open business atmosphere here in Mahahual. Also Mahahual is a good place to live because you can live better without as much money compared to places like Tulum or Playa del Carmen. Juan Carlos said he plans on being in Mahahual a long time, he does not expect to get rich, but he feels he has a great life here, and that matters more than a lot of money. He told me he has seen the growth here, and he expects a lot more growth in Mahahual in the next six years, and I agree with him. 8 cabins on the sea: berth or double bed, mosquito net and shared bathrooms. 8 cabins in second sea line: Bunk or double bed, mosquito net and shared bathrooms. 8 cabins third line sea berth or double bed, mosquito net and shared bathrooms. 1 family cabin: a king size bed and two hammocks with private bathroom. 7 family cabins: a king size bed, a bunk bed and a hammock with a private bathroom. All the properties features 24-hour reception and our cabins and hostel offer daily cleaning included in the price. $ 800.00 to $ 1,600.00 MXN. Depending on cabin type and season. The best beach in the village of Mahahual is Blue Kay Beach Club, with the perfect location that offers privacy and contact with nature, covering all your needs for unforgettable beach days. The protection of the coral reef creates an ideal place to discover the wonders of the reef swimming from the shore, dive with snorkel gear or diving, take a kayak ride, glide with the wind on a sail boat or just swim in the warm waters of space Caribbean Sea. The relaxed and friendly atmosphere allows you to enjoy the beach as you like: in the hammocks and lounge chairs under the protective shade of palm trees, sipping your favorite drink and tasting the delicious dishes of our restaurant with bare feet in the sand, then take a soothing massage while waiting for sunset. Blue Kay Beach Club is room for everyone: a very safe beach for children, romantic places where you take a couples massage or join your group of friends to share great moments. They handle even your most intimate, offering yoga classes at sunrise to renovators Temazcal baths. Blue Kay has a Temazcal, Mayan steam bath. Blue Kay is expanding this year. 30 more cabanas are going to be built on the property, as well as Blue Kay Jungle, which is just around the corner and about 200 meters from the entrance into Mahahual on the main road. Blue Kay Jungle will be a hostel with rooms and cabanas and will open in the next two months. The prices there will be from 200 to 800 pesos a night. Blue Kay also has an excellent restaurant and beach club. The restaurant serves seafood, Mexican, Tex-Mex, and local cuisine. They have a full bar and a nice and friendly staff. Blue Kay also does a Beach Break for cruise ship tourists here for the day. Are Vacationing to Mahahual by cruise or visit us ?. Blue Kay have the largest and most beautiful stretch of private beach in Mahahual all with an atmosphere that will captivate you either look for us to relax, to live an adventure in our activities beach or have fun at the bar … you choose. Come with us to spend a day in paradise. Cost is $45.00 usd per person. Blue Kay has a lot going on at their beach club like live music, karaoke, and other activities. There is always a nice crowd at their bar and beach. Blue Kay also offers a volunteer program for people wanting to work their way through Mahahual. The volunteer Bluekay is for a period of 2-14 weeks and is helping in reception areas, garden maintenance, painting, beach cleaning, customer service, etc. 6 hours 5 days a week; in exchange we provide lodging and two meals a day . We require only identification you describe a bit and we’re doing, experiences, trades, you want to do, etc. and date LOVE visit. Every two weeks we have a potluck or before a meal, campfire, or celebration with volunteers. Water activities, bar drinks, laundry, etc. they are provided primarily to cost. Volunteers are usually between 5 and 15 people profiles sought are: administration, reception, social networking, promotion, beach clean, green areas and cabins, order furniture and chairs, surveillance, laundry, painting, photography, water, light construction, assistant maintenance, kitchen, restaurant and bar, etc. Breakfast is served at 9:00 am and 9:30 am meeting of 5 to 15 minutes of coordination and feedback is performed. Lunch is served at 4:00 PM. 50% discount in our Restaurant-Bar, laundry, activities and services we offer applies. Blue Kay easy to find. So if you want to stay in a cabana on the beach on the beach here, you have to check out Blue Kay.